Just a quick update for those following me on other platforms such as Bloglovin- I’ve changed my blog address as I now have my very own domain! I also realised how much I miss exercising!! Running used to give me such a high and there were a few years where I ran 5km everyday and 10km at weekends without fail. But being pregnant and then having a baby to look after has meant I haven’t been able to exercise properly in 18 months or so. Now, don’t get me wrong, walking 5km around a lake with either a 10kg baby strapped to me or pushing a pushchair is a great workout! but I do miss the ‘me’ time that running gave me. So this week my husband and I invested in a cross-trainer (it came 4 days ago and I haven’t used it once yet haha). But you get the picture, spending 30 mins or so doing exercise a few times a week will make me a much happier woman! Also this week we have been trying to remain healthy, local and fresh with our food. I have to be really careful with what I eat because Thomas has a milk allergy (and maybe wheat/gluten/other allergies) so as I’m breastfeeding, I can’t have any dairy (which makes me so sad as I love yoghurt! and coconut milk in tea and coffee just isn’t the same!). I have been researching a lot about recipe ideas and inspiration. What I’ve decided is that I’m going to eat more Asian foods. My husband is from Thailand and I have lived there for quite a few years so it’s easy for us to just switch as they don’t use dairy in their cooking, and don’t use much wheat either, so it’s perfect for us. I made a great Thai chicken salad….super spicy…my husband loved it. 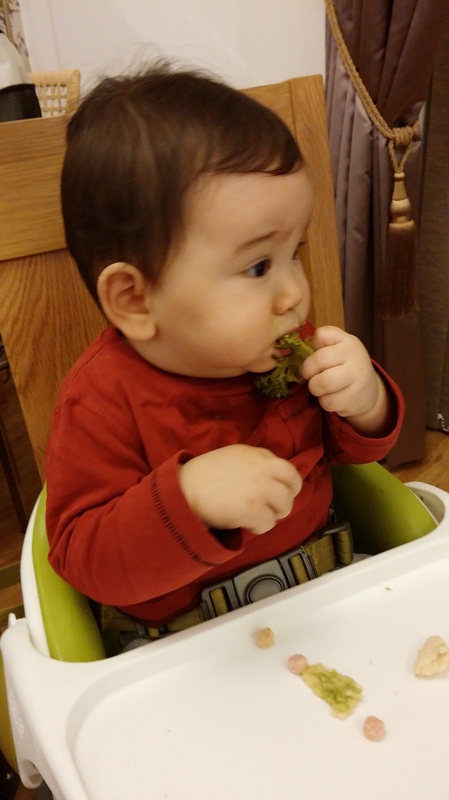 For Thomas I cooked up a few days worth of food – pear purées, pepper, quinoa, avocado and kale purées and chicken and squash purées (I also will give him finger food at most meal times….broccoli being his favourite!). He finally used up all the beetroot purées I made the other week- they were a firm favourite so I am really glad Riverford put more beetroot in this week’s veg box! very grateful for that! A breakthrough this week has been that I am finally coming to terms with Thomas’ napping issues. I’ve been killing myself trying to get him to nap as much as possible- sometimes staying in bed with him for 3 hours just to get him to take a 30 minute nap! I waste my days trying to get him to drift off. This week however, I’ve just taken it as it comes- I let it go if he doesn’t want to nap and just stays awake for 6 hours. I let it go if he can only sleep on my husband’s chest (I’ve always made a point of trying to let Thomas nap in his room in the same place as where he sleeps). I’ve just let it go. I became obsessed with getting him to sleep the recommended 14 hours which he is currently way under. If he only gets 10 or 11 hours then so be it. I had hoped cutting out dairy from my diet would help his sleep but it hasn’t (so far, it’s been around a month now). I have to trust that the time will come where he will just nap. Something that totally shocked me this week was that my husband got some brochures for holidays! Now, neither of us have been on a holiday in TEN YEARS! (well, we have been to Bangkok to visit his family 4 years ago but this wasn’t really a holiday!). So it was really realllyyyy nice of him and I am VERY excited!!! He is due to hand in his PhD thesis in June so we are thinking of going to Greece, Italy or Turkey in September BIG SMILE ON MY FACE 🙂 Which leads me to the last and most time consuming thing he’s done this week- his thesis. But I won’t bore you with the details!! I am the worst person in the world for social media when it comes to my blogging. So this week I have tried to be more proactive when it comes to things like twitter, facebook and linkys. I set up my facebook page for my blog a few weeks ago now, you can find it here. I have 25 likes so far! whoo hoo hahaha. I think if I logged on more than once a week I would have more likes by now…so this is something I need to work on in the future. But it will have to wait until I finish helping my husband with his thesis (I am editor and SPSS checker). He only has 2 and a half months of hard work to go and we REALLY can’t afford to miss his deadline. I also set up an Instagram account for my blog. 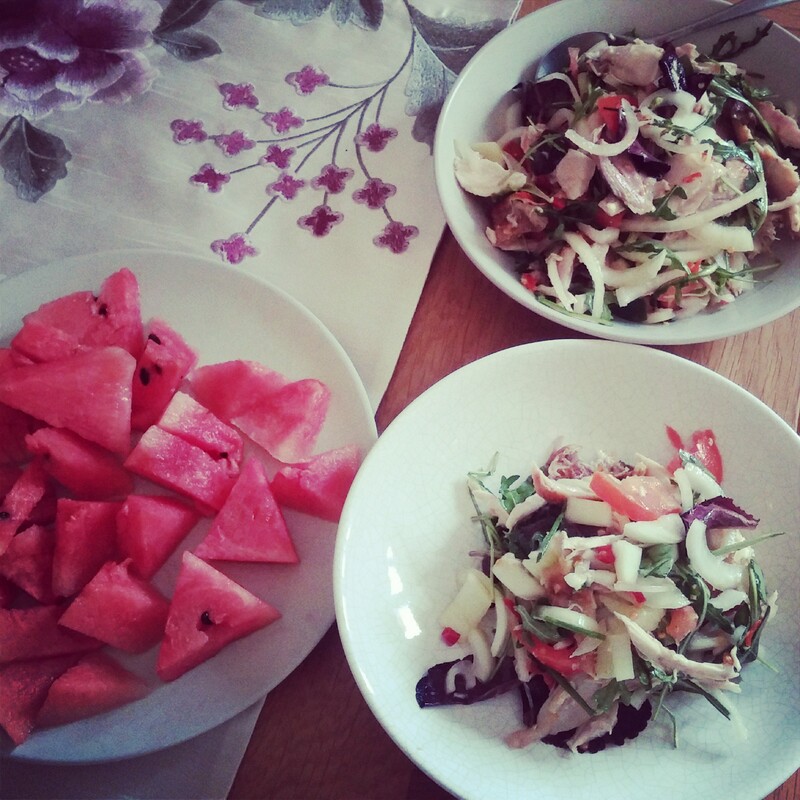 It’s called HealthyHappyMumma and has over 50 followers already! I no longer wanted to use my personal account as that is more geared towards friends and family who have no idea I even write a blog! Instagram is my favourite form of social media, it’s spontaneous and a picture can say a thousand words. I’m still using my old Twitter account. My username is @naang_aen which is a bit weird! It means Swallow Bird in Thai, I set it up years ago before I started blogging. Again I have tried to interact with other bloggers on there, especially others who have been nominated for the MAD Blog Awards in my categories. They are all such good bloggers and nice people! My blog has been quiet this week as I haven’t logged on much. It has highlighted to me that you only get out of blogging what you put in. Successful bloggers work REALLY hard and post everyday. This is just something I can’t do right now. And I’m not sure if it is even something I want to do. I love looking at blogs like Healthy Diva and seeing what she buys and what she has been up to. But I don’t think it would be sustainable for me and my life isn’t that interesting! 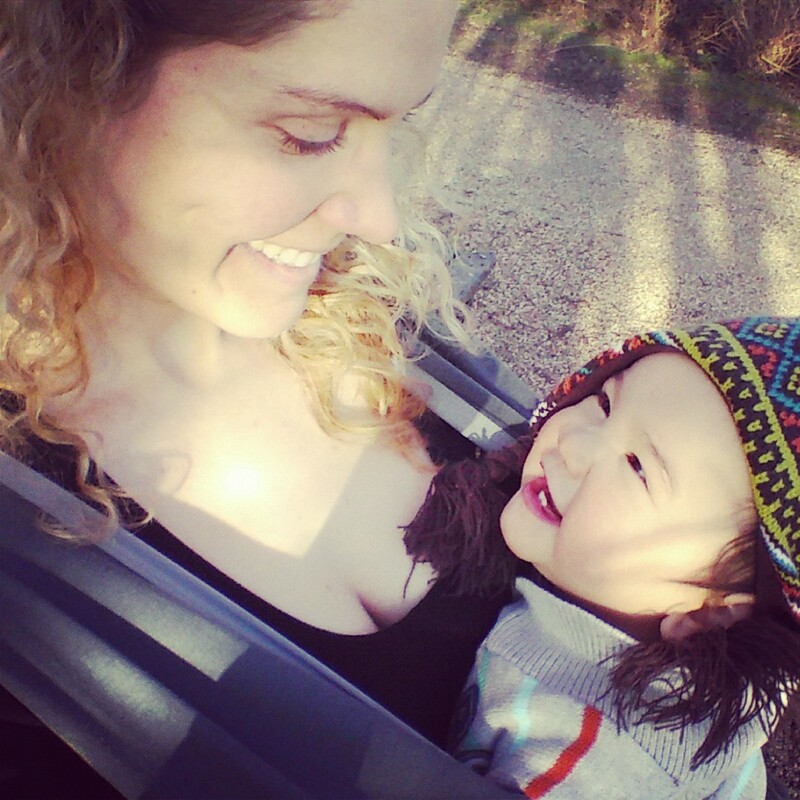 Although Hannah from Mumsdays seems to be making blogging everyday work, right Hannah? As always I’ve loved Steph’s blog Littleeandbean, her writing gives me a sense of warmth and nostalgia for writing. I don’t have the time right now and reading her posts is just the highlight of my evenings sometimes! The post she wrote for International Women’s Day was particularly good, so please read it if you haven’t already! I also discovered Le coin de Mel written by Mel. She is lovely and not only is she a brilliant cook, she also has a little one with similar allergies to Thomas. Her posts on allergies have been another highlight of my week. Other things I’ve been up to this week blogging wise should appear here and here soon! Thank you Hannah for hosting such a well thought out Linky! It makes a refreshing change from other ones! I like something a little different 🙂 I am sure it will grow very quickly! This month has been hectic, uneventful, but hectic! We have been trying to get in study everyday as my husband has to finish his PhD thesis in the next few months….so it’s been a juggle trying to keep Thomas entertained whilst also writing a thesis! We stayed in everyday, just playing with Thomas, taking turns getting him to nap and feed him and studying.So when I say ‘uneventful’ I meant very very busy, but doing nothing exciting! The most exciting thing that I did was make Thomas his dinners! Luckily this month he has been SUPER good with his food. I’ve even tried banana again and he was fine with it! hoo-rah! Like last month, I’ve been giving him a mixture of purées and finger foods. 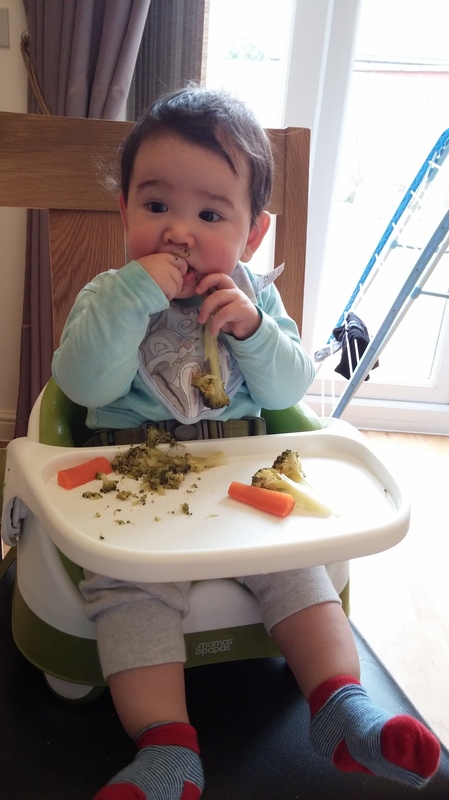 His favourite is broccoli …. I can put a selection of things in front of him and it’s always the FIRST thing he goes for- good boy! Thomas has a milk allergy and I was really upset that I couldn’t give him yoghurt. So I did some research and got some CO YO coconut yoghurt and he LOVED it….and I mean totally and utterly loved it….he just kept eating and eating and eating….I eventually had to stop him as he would have given himself a stomach ache as it was a big tub of yoghurt!! Things that I am really struggling with are breakfasts. Without milk and eggs it’s difficult to think of ideas. Thomas had stomach aches after baby rice, weetabix and oats…so I am really running out of ideas. I only give banana and coconut yoghurt occasionally as I do think they make his reflux worse, so only really give them when I want him to get some extra vitamins and variety. I end up giving him pear purée most mornings as he gets constipation and I’m trying to ease it. But I think it may be a little boring! 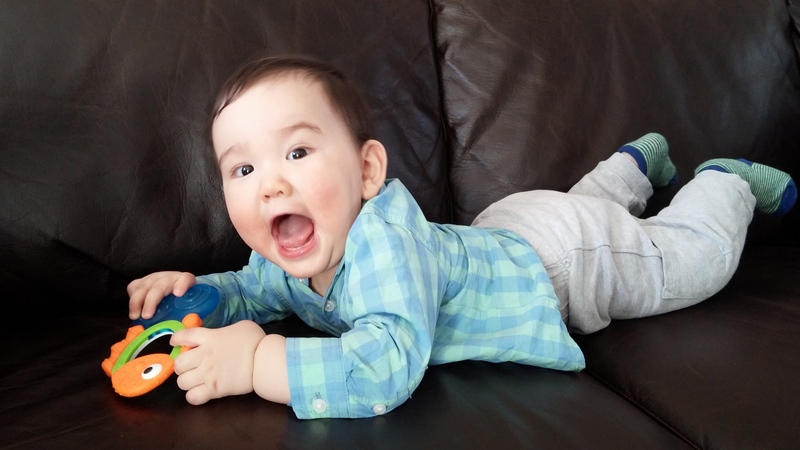 Does anyone have any breakfast ideas for a 8 month old with a cow’s milk allergy? Anyway, I am really happy with how this month turned out, no new reactions to anything 🙂 Next up to try out is quinoa and lentils to give him some variety from sweet potatoes and butternut squash! 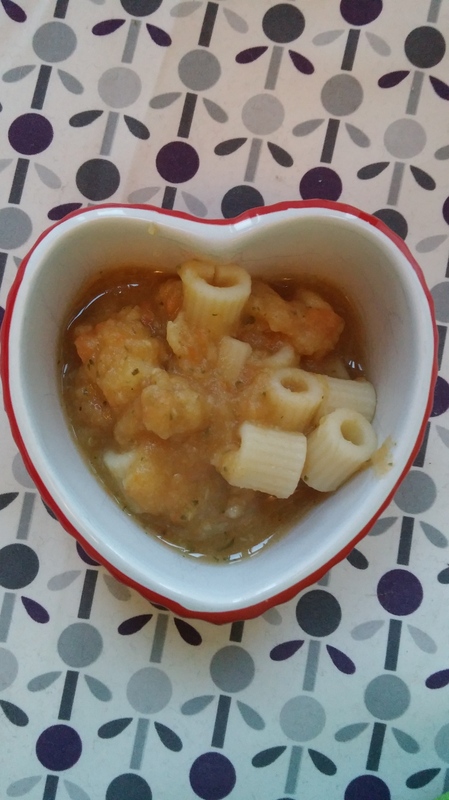 I am linking this post to Munchkin Meals , thanks Brittany for hosting! 2 bottom teeth have grown in size, no new teeth yet though! Love rolling alllllll over the place! He also loves hitting his thigh and my hand with his hands to make a noise- he still hasn’t mastered how to clap his own hands…nearly there though! He can get up onto his knees sometimes, and likes to crawl commando style, but not proper crawling YET (Thankfully as I still need to babyproof!). He can still get anywhere he wants to go though. Breakfast is at 7am, lunch at 12 noon and dinner at 5pm. Naps include a 30 min nap around 8.30am (sometimes it’s an hour if I can catch him in time and rub his back before he wakes himself up fully). 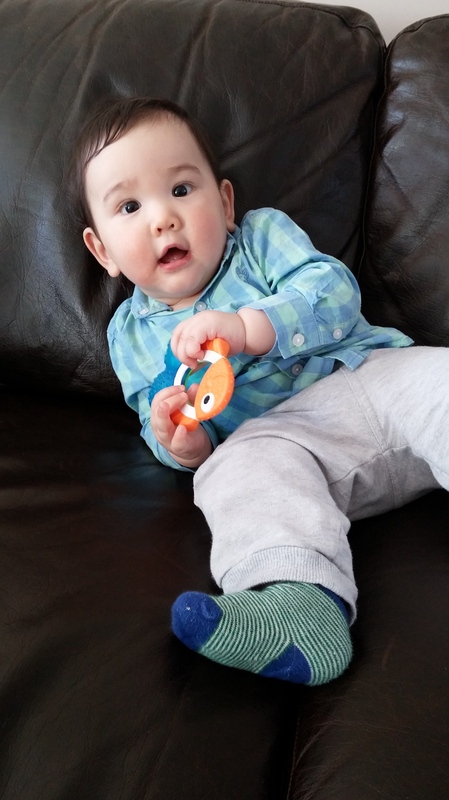 He will take a longer nap around 11.30am- but I have to stay with him or his dad does. This nap is usually an hour and a half. Then he may take a short 30 min nap around 3pm but this is hit or miss. It’s ALWAYS a struggle to get him to nap during the day! We have tried more or less the same as last month as I am scared to introduce too many new food because he may be allergic. With the addition of beetroot purée and coconut yoghurt. 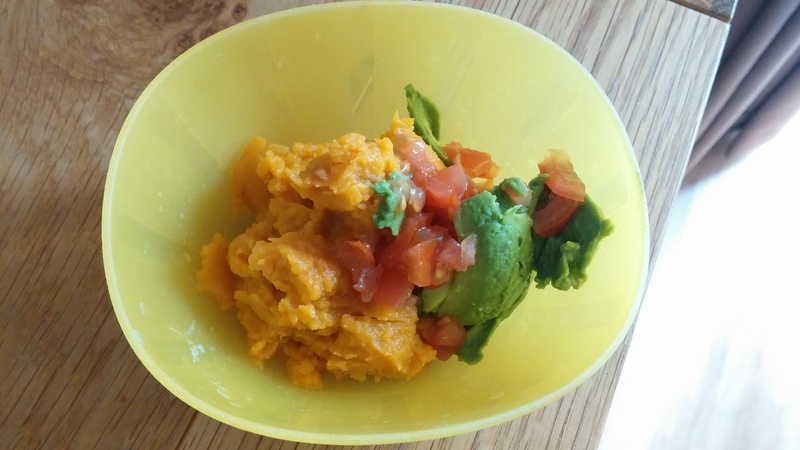 I’ve kept him eating butternut squash, sweet potato, avocado, peas and broccoli most days as I know he has no reaction to these foods. I’ve stopped giving Thomas any dairy, including yoghurt as he has a suspected Cow’s milk allergy (Thomas will get blood tests at the end of March to confirm). I’ve also stopped giving him cereals and bread as I think he also has an allergy/reaction to wheat or gluten. Pears seem to be OK now, so I try to give him some every 2 days as he gets constipation easily. I also give him more water now too with meals to try and ease his bowel movements! Thomas still LOVE to breastfeed. 5 times in the night. 5 times in the day. Loves me singing, especially whilst bouncing and/or clapping his hands for him. Still the happiest baby I know! This month has been long, very long. The stress never seems to end. We went to see the allergy specialist at the beginning of the month and he thinks Thomas is allergic to cow’s milk. 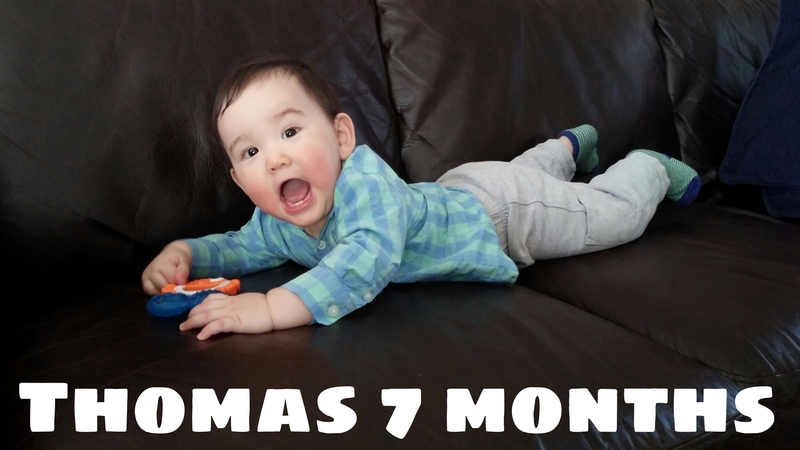 He said he was shocked and appalled that it has taken 7 and a half months for Thomas to be diagnosed and that I had been let down by my doctors and health advisors. It’s true. I do feel let down. When I first went to the GP with Thomas’ reflux he told me it was normal and he would grow out of it. 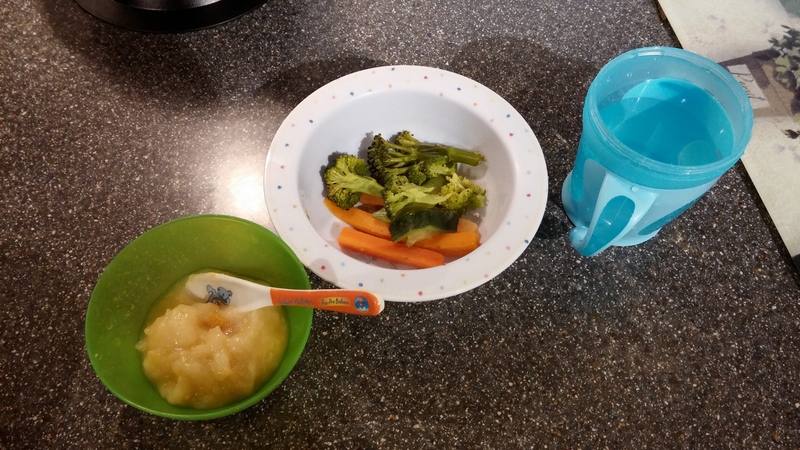 The health advisors all knew about Thomas’ reflux and sleep problems, and yet they still advised me to pick up the pace feeding him solids and introducing new foods. I told them he couldn’t even handle baby rice, but they said to keep trying. The longer you keep feeding a food that causes an allergic reaction to a baby, the less likely they are to grow out of it. Therefore it is better if they are diagnosed with an allergy ASAP. You cut out that food for a period of time and then introduce it back into their diet 6 months or a year later if it is not a severe allergy. But I’ve been breastfeeding and eating dairy for the past 7.5 months. All along it was ME that was making Thomas roll around in pain. It was ME that was causing his sleeplessness. It was all my fault. I knew in the back of my mind something was wrong. I suspected an allergy to milk, gluten, wheat, eggs or nuts. Something. It just goes to show, as a mother, if you have a gut feeling LISTEN TO IT!! The doctor gave me hypo-allergenic formula milk if I wanted to stop breastfeeding and give Thomas formula instead. But I don’t want to give him formula. I’m not ready to let go to breastfeeding yet, and I don’t think Thomas is either. Baby rice, Oats, Weetabix, Bread, Yoghurt/milk, Banana, Plums, Apples and he projectile vomited after eating a pancake (egg?). In my diet, I eat a lot of peanut butter (on toast for breakfast), almond milk, dairy (mostly in the form of yoghurt and chocolate), wheat and gluten (mostly through wholemeal bread). I’ve cut out all dairy for the past 2 weeks now and I don’t see much of a difference in Thomas’ reflux, stomach cramps or or sleep 😦 I know it may take 2 weeks to leave my system, and another week or so to leave the baby’s system so I will keep going, but I can’t help thinking there is also something else at play here too. I don’t have any allergies in my family, all of this is totally new to me. I’m going to cut out nuts, dairy, wheat and gluten from now on until I see the specialist again at the end of March. I need a better understanding of allergy diets for a breastfeeding mum. Most of all my GPs and HVs should get up to date with allergy symptoms. I know it’s hard as the symptoms are similar to other things and most babies have them. But 7.5 months of utter bullsh**, pain and no sleep is a joke. Right, better get cracking on finding recipes that CAN eat! 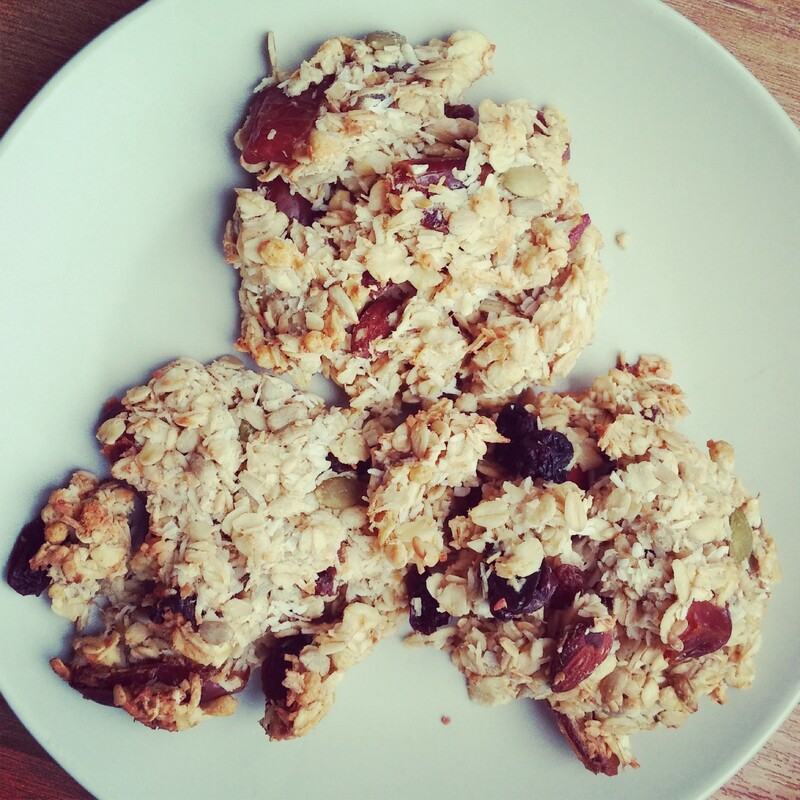 There is a new craze on Instagram right now on healthy eating which is mostly vegan. Deliciously Ella is probably one of the most well known. Better start there then. 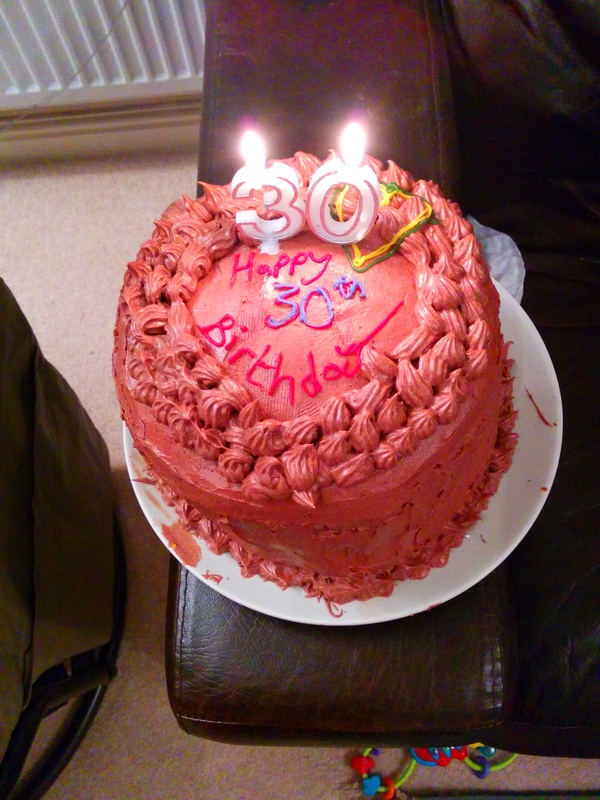 The photos are terrible as the lighting was low…it was my husband’s 30th birthday (yes, he is younger than me ;)) and it looks like Thomas decorated the cake (I need to practice my decorating skills!!!) BUT it tastes like heaven! Preheat the oven to 170 degrees. Prepare three, 9 inch cake pans by lining each of them with parchment paper, buttering them, and dusting them with flour. Sift the flour, sugar, cocoa, baking powder, and salt into the bow of a mixer. Combine the non-dairy milk, vinegar, coffee, oil, vanilla extract in a medium bowl. Beat in the eggs. With the mixer on low mix everything until combined (mix wet ingredients first then slowly add the dry ingredients). The batter will be very thin. Divide the batter equally between the three prepared pans. Bake for about 30 minutes, rotating pans half way through baking. 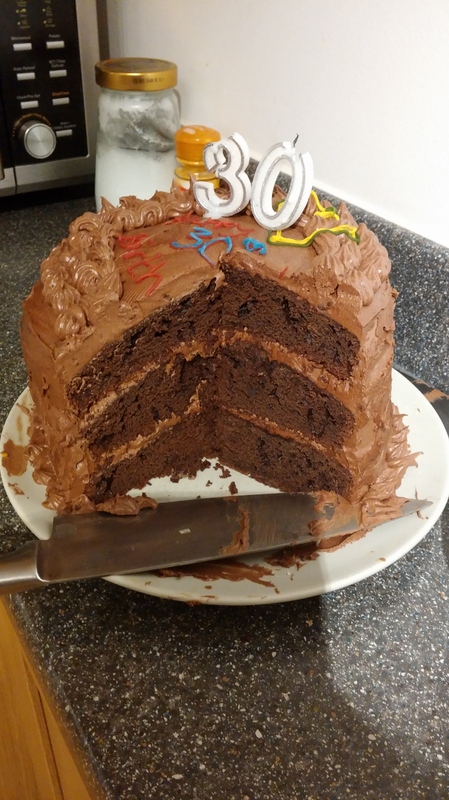 Make sure the cakes to cool completely before frosting. Sift and mix the icing sugar and cocoa in a large bowl. Beat the butter for a few minutes until it is creamy. Add the dry ingredients to the butter. Then add the non-dairy milk and mix everything using the food mixer until a creamy, smooth texture is achieved. 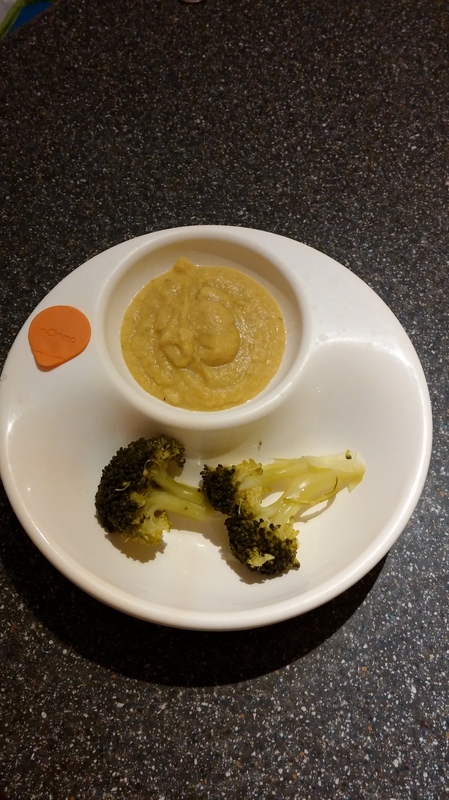 I have been using a mixture of baby led weaning and purées. I use purées to make sure he is full, but always offer some finger foods as well. 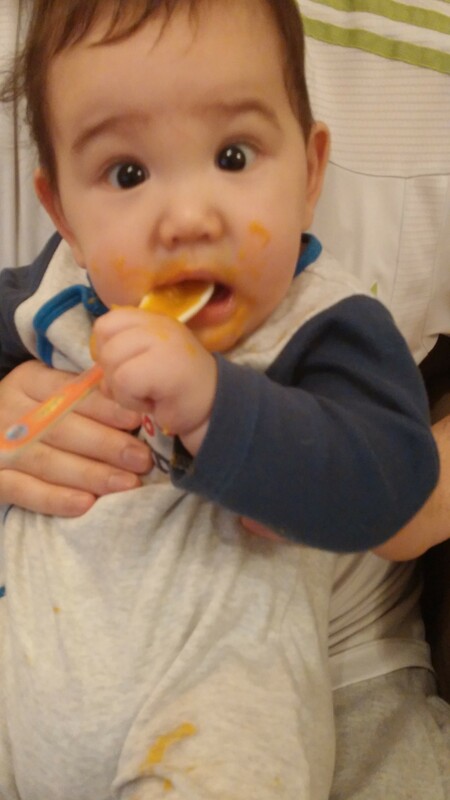 I soon discovered at 6 months that he preferred to feed himself most of the time, even with the spoon (granted it can be VERY messy!). 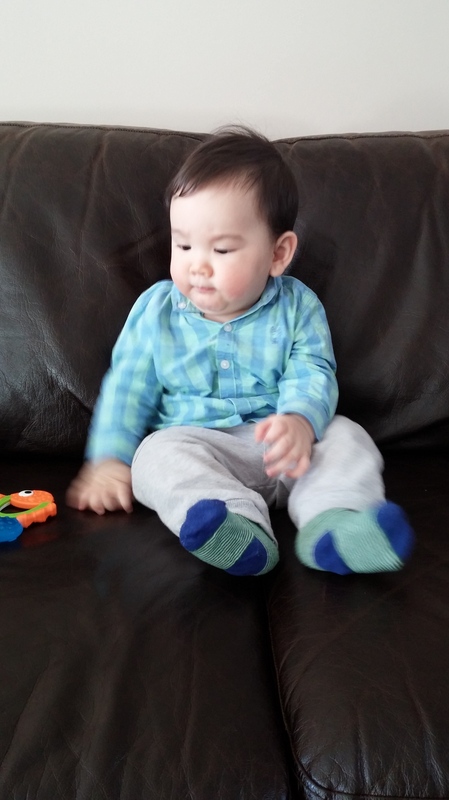 At 6 months I started on the recommended baby rice and baby oats….BUT he had such a bad reaction (redness, screaming for hours and arching his back) that I haven’t given them to him again. 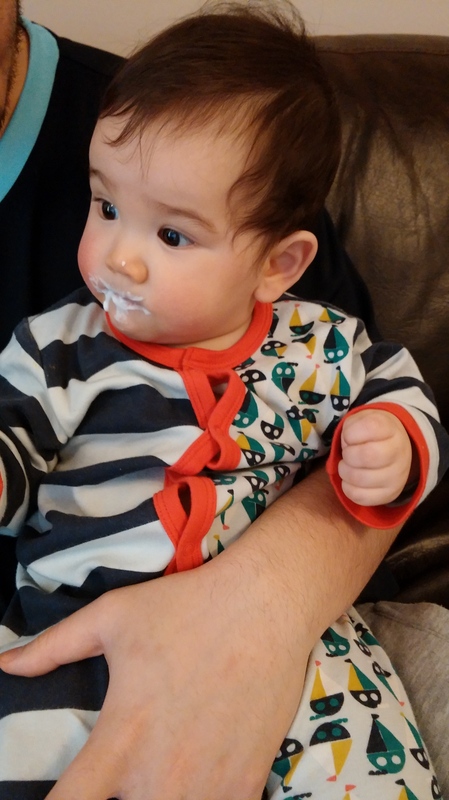 I used breastmilk in the rice but normal cows milk in the oats (and have a feeling it could be a reaction to the milk- as he also has this reaction to yoghurt). To determine if milk is the culprit of his discomfort I’ve been giving him yoghurt and cheese by themselves to see if he has a reaction. And the outcome is very confusing! 2 out of the 5 times he had yoghurt he was fine!? and the one time he had a cheese sandwich he was fine. So I need to investigate more! 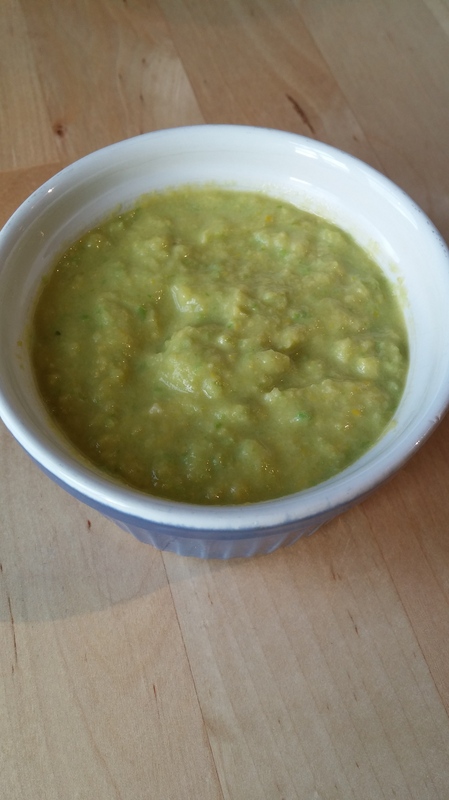 For lunch I always try to give him something new- yesterday we had chicken, sweetcorn and pea puree. He LOVED it! It was the 1st time I’ve given him chicken. Then for dinner we usually have leftovers or something quick. Thomas is usually tired by 5pm and so I have to think of something easy for him before he gets bored of waiting for me to cook! 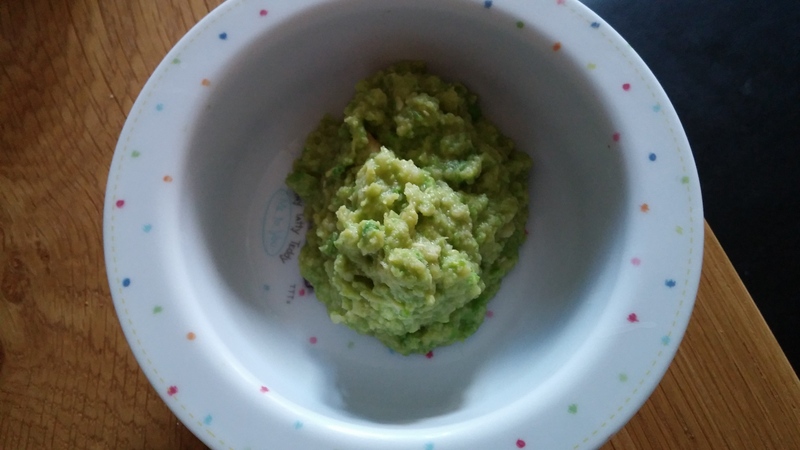 Yesterday he had steamed broccoli and pitta bread with mashed avocado on as finger foods and some ‘puffets’ (wholegrain little balls, I think they are by Ella’s Kitchen) which he likes to pick up and mostly throw on the floor! But by doing this his pincer grip is getting really good! 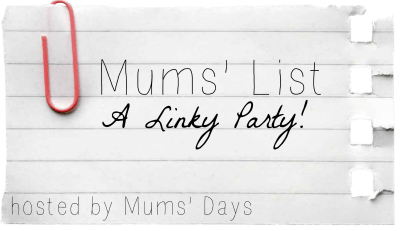 I am linking up to ‘Munchkin Meals’ as I am in need of some new ideas! !